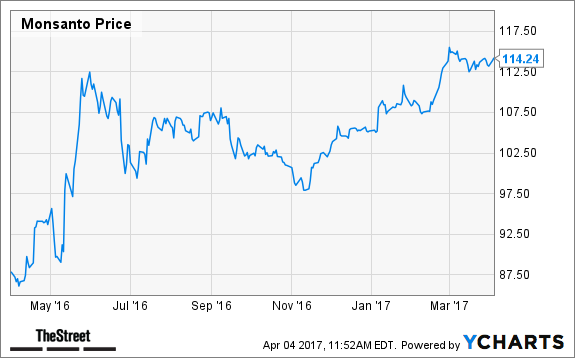 Jim Cramer is watching Monsanto earnings, but for a read on its deal with Bayer rather than the actual results. TheStreet's Jim Cramer told "Mad Money" viewers what he'd be watching this week during his "Game Plan" segment on Friday. One of the events he has his eye on includes earnings from Monsanto (MON , due out Wednesday before the open. For those unaware, Monsanto is being purchased by Bayer for $66 billion. Like other large M&A deals, there have been bumps in the road. But it's these bumps that are being watched by Cramer, the manager of the Action Alerts PLUS portfolio. Since Monsanto is likely being acquired, the earnings aren't really the focus. Investors will want to see progress in an update on the Bayer deal, Cramer reasoned. The merger between Dow Chemical (DOW and DuPont (DD is also of interest. Cramer will be listening to the Monsanto earnings call to get any insight on possible implications for Dow. Dow is a holding in Jim Cramer's Action Alerts PLUS Charitable Trust Portfolio. Want to be alerted before Cramer buys or sells DOW? Learn more now. Investors who are long Dow should stay long, because the union with DuPont will turn the combined company into a powerhouse, Cramer suggested. Earlier this week, Cramer praised DuPont's move to sell its crop-protection business to FMC Corp. (FMC - Get Report) in exchange for the latter's health and nutrition business and $1.2 billion in cash. It's a win-win for both companies, he concluded. At the time of publication, Cramer's Action Alerts PLUS had a position in DD.